Leo October 2017 Horoscope forecasts that the planetary power is located in the Southern half of the horoscope towards the mid heaven sign. The House of Family is very dominant this month. Due to planetary movements, family concerns along with emotional matters will be in center stage for the Leo zodiac person. Career also will be very active due to the influence of Mars in October 2017. Planetary aspects will pull the Leo personality in different directions in October 2017. You will come across all types of challenges in life. Your success in October 2017 depends on how you manage various interests and people with your experience and wisdom. The 2017 October astrology forecasts predict that events will be affected by the two eclipses this month. The Solar Eclipse of the 3rd of October 2017 will influence your basic outlook and your idea of self. You may indulge in detoxification of the body to get rid of impurities. Leo personalities pursuing academic career may have to switch over to a different subject or a different institution. Others may be drawn towards higher studies or intellectual faculties in October 2017. The Lunar Eclipse of the 17th of October 2017 will question your spiritual understanding. The lions may be forced to review their present ideas about religion and philosophy. You may formulate an entirely new set of beliefs. The horoscope 2017 yearly prediction forecasts that the Leo’s professional objectives should be accomplished with complete emotional stability. You should try to have pleasant relations with your colleagues and the management. Sun will influence the Leo business life till the 20th of October month of 2017. There will be hectic activity in your career environment. The organization will undergo significant transformations and you may be forced to look for another job. The October Leo 2017 monthly horoscope also foretells that your earnings depend on your diligence and you make money by offering your financial expertise to others. Speculations will give good returns. Money will be spent on charitable activities and for the help of friends. You have to limit your spending after the 21st of October 2017. You will be successful in new monetary projects after 21st October 2017 but in collaboration with others. Try these Feng Shui tips for money and wealth. The Leo horoscope for October 2017 predicts that many planets including Uranus and Neptune will affect your romantic life this month. There will be many romantic opportunities for single Leos, but serious love is difficult to achieve. Read more about dating a Leo. Your love life will stabilize after the 20th of October 2017. Single Leo men and Leo women will find love mates while pursuing their monetary goals or in the job environment. You may find love in senior people too in October 2017. You won’t be serious about marriage or having children this month. The October 2017 Leo zodiac predictions warn that your health will be fragile this month. You will be under stress due to your preoccupation with various things. As it will be impossible to relax, you have to work smartly on important things. All difficult things should be taken up at a later date. Here are a few home remedies for drowsiness and chronic fatigue. 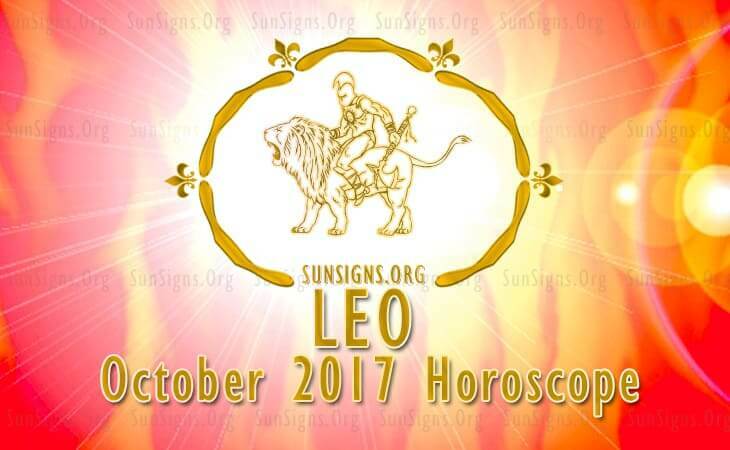 The Leo horoscope for October 2017 foretells that your emotional nature will make it difficult for you to take important decisions this month. i am very happy cause this month i will be ill.